Հաճախ Նիցշեի միտքն ու գործը որոշակի շրջանների են բաժանում։ Ընդունված է հետևյալ դասակարգումը. Վագներյան-շոպենհաուերյան շրջան (1872-1876):- Այն հատկանշվում է այս երկու անձանց ազդեցությամբ և ռոմանտիկական գունազարդմամբ։ Այս ժամանակահատվածը ընդգրկում է հետևյալ երկերը. "Ազատ մտքի" շրջան (1876-1882): - Նիցշեն գնալով ազատվում է Վագների ազդեցությունից և շոպենհաուերյան փիլիսոփայության կաշկանդումներից։ Այս շրջանում առաջին պլան է մղվում գիտական-էմպիրիկ ճանաչողությունը։ Նաև սա է պատճառը, որ այս հատվածը նաև՛' պոզիտիվիստական (դրապաշտական) է կոչվում: Նախկին համակարգված շարադրանքին հետզհետե փոխարինելու է գալիս ասույթային պասսաժը, որը ֆրանսիացի բարոյագետների նախընտրած ձևն էր և Նիցշեի գրչի տակ նոր կերպարանք է ստանում: Երկերն են. Այստեղ մինչայժմյան գաղափարները ընդլայնվում և ավելի սուր բանավեճի են վերածվում: Ասույթների և սենտենցների կողքին կրկին սկսում է ի հայտ գալ առաջին շրջանի համակարգված շարադրանքի ոճը: Այս շրջանի գործերի մեջ են մտնում. Քրիստոնեության քննադատությանը նվիրված իր գլխավոր աշխատությունը Նիցշեն անվանել է «ՀակաՔրիստոս. Նզովք քրիստոնեությանը»: ՀակաՔրիստոսն աշխարհընկալման քրիստոնեական մոդելներում Հիսուս Քրիստոսի հակառակորդն է կամ կեղծ Հիսուսը։ Ենթադրվում է, որ նա անխուսափելիորեն կպարտվի այն բանից հետո, երբ երկրային ժամանակի ավարտին կըմբոստանա Հիսուսի դեմ։ Քրիստոնեության վաղ շրջանում այդ կրոնի տարբեր ազդեցիկ թշնամիներն ըմբռնվում էին որպես ՀակաՔրիստոս։ Սակայն ըստ առավել լայն և ընդգրկում մեկնաբանությունների ՀակաՔրիստոսը մեղքի մարդն է, որն հակադրվում և ինքն իրեն ավելի բարձր է դասում այն ամենից, ինչ կոչվում է Աստված։ Նոր Կտակարանի տեքստերում յուրաքանչյուր ոք, ով չի ընդունում այսկողմնային աշխարհում Աստծո մարմնացումը, հանդես է գալիս որպես ՀակաՔրիստոս։ Քրիստոնեության քննադատության մեջ Նիցշեն առաջնորդվում է հետևյալ մեթոդաբանությամբ. «Չարից և բարուց անդին» երկում (19-րդ ասույթ) Նիցշեն ցույց է տալիս, որ կամքը, ամենայն կամեցում բաղկացած է առնվազն յոթ կարևորագույն պահերից. «վիճակի զգացումը, որից մենք ձգտում ենք ազատվել և… որին մենք ձգտում ենք հասնել…»,- ինչպես նաև սրան առընթեր «մկանային զգացումը». «Յուրաքանչյուր կամային ակտի մեջ գոյություն ունի կարգադրիչ-հրամայիչ միտք. սակայն պետք չէ մտածել, որ այդ միտքը կարելի է բաժանել «կամեցումից» և որ «այդ ժամանակ կամքը իբր դեռ կմնա». կամքի մեջ «բռունցքվելն» է, «այն ուղիղ հայացքը, որը բացառապես մի բան է ֆիքսում, «այժմ հարկավոր է այսինչ բանը և ուրիշ ոչինչ» դրույթի անպայմանական գնահատումը». «մարդը, ով կամենում է, հրամայում է իր մեջ ինչ-որ բանի, որը ենթարկվում է, կամ որի մասին նա մտածում է, թե նա ենթարկվում է». «քանի որ մենք միաժամանակ հրամայողը և ենթարկվողն ենք, ապա Ես համադրական հասկացության օգնությամբ … կամեցողը ենթադրում է, թե կամքը և գործողությունը ինչ-որ կերպ նույն բանն են կազմում». Նիցշեն երկու կարևոր կարգ է տեսնում հունական կյանքում, որոնք նա կոչում է դիոնիսոսյան և ապոլլոնյան։ Դիոնիսոսյանը, արբեցուցիչը, բնականը (էքսպրեսիոնիստականը), մինչ ի անզսպություն և շվայտություն դրսևորվող նախակամքն է, ինչպես որ այն արտահայտվում է երաժշտության մեջ։ Ապոլլոնյանը գեղեցիկ արվեստների և ներդաշնության կերպավորող (դասական) ուժն է։ Այս զույգ հակադրությունների համագործակցությունը Նիցշեն համարում է ինքնին մարդկային կյանքի իրավիճակը. Իբրև կյանքի հաստատում մեջտեղ է հանվում մտածողության մի այլ գեղագիտություն կամ մեթոդ. ծիծաղի և պարի թեթևությունը: Ողջ հրճվանքն ուզում է հավերժություն: Կյանքի արարման գերագույն ձևը իր կատարելությանն է հասնում Վերադարձի մատանի-ով: Անգամ եթե աշխարհը զուրկ է աստվածային վերջնանպատակից, միևնույնն է, գերմարդը ինքնահաստատման իր արարչական գործունեությամբ, ինքնակատարելության իր ձգտումով հաստատում է Նույնի հավերժական վերադարձը՝ ասելով. թող կյանքը լինի այն, ինչ կա, ես կամենում եմ այն, ես հաստատում եմ այն, որովհետև ես միայն նրանով կարող եմ իմ կատարելությանը հասնել: Գերմարդու նախասկզբնական ձգտումը մի անուն ունի՝ Բոլոր արժեքների վերարժեքավորում: Սա է, որ կարող է լինել նրա արարիչ լինելու կամքի նախապայմանը: Գերմարդը նա է, ով իր այդ արարչագործականությամբ անընդհատ զորանալու, իշխանություն ձեռք բերելու բնական ձգտումով է առաջնորդվում: Հրամայել - ահա գերմարդու կամեցումը, սակայն առաջին հերթին հրամայել ինքն իրեն: Գերմարդու նոր առաքինություններն են. Զվարթ գիտությունը (Die fröhliche Wissenschaft („la gaya scienza“), 1882 KSA 3. ), թարգմանվել է հայերեն Հակոբ Մովսեսի կողմից. Werke. Kritische Gesamtausgabe Sigle: KGW [auch: KGA (Verlag)], hrsg. von Giorgio Colli und Mazzino Montinari. Berlin und New York 1967ff. 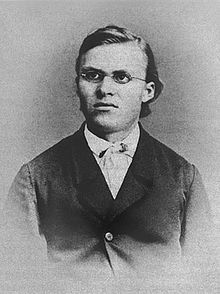 Ivo Frenzel: Friedrich Nietzsche in Selbstzeugnissen und Bilddokumenten. Rowohlt, Reinbek bei Hamburg, Neuausgabe 2000, ISBN 3-499-50634-3. Christian Niemeyer (Hrsg. )։ Nietzsche-Lexikon. Wissenschaftliche Buchgesellschaft, Darmstadt 2009, ISBN 3-534-20844-7. Keith Ansell Pearson (Hrsg. )։ A Companion to Nietzsche. Oxford / Malden: Blackwell 2006, ISBN 1-4051-1622-6. Maudemarie Clark: Nietzsche on Truth and Philosophy, Cambridge 1990, ISBN 0-521-34850-1. Günter Figal: Nietzsche. Eine philosophische Einführung Reclam, Stuttgart 1999, ISBN 3-15-009752-5. Stefan Lorenz Sorgner/H. James Birx/ Nikolaus Knoepffler (Hg. )։ Wagner und Nietzsche: Kultur-Werk-Wirkung: Ein Handbuch. Reinbek b. Hamburg, Rowohlt, 2008, ISBN 978-3-499-55691-3. ↑ 1,0 1,1 1,2 German National Library, Berlin State Library, Bavarian State Library et al. Record #118587943 // Gemeinsame Normdatei — 2012—2016. ↑ 6,0 6,1 International Music Score Library Project — 2006. ↑ 8,0 8,1 Discogs — 2000. ↑ 11,0 11,1 Ницше Фридрих // Большая советская энциклопедия: [в 30 т.] / под ред. А. М. Прохоров — 3-е изд. — М.: Советская энциклопедия, 1969. 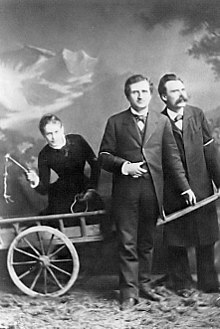 ↑ 13,0 13,1 13,2 "Friedrich Nietzsche," by Dale Wilkerson, The Internet Encyclopedia of Philosophy, ISSN 2161-0002, http://www.iep.utm.edu/nietzch/(չաշխատող հղում). 14 October 2015. ↑ 15,0 15,1 The time allocated for running scripts has expired. ↑ 16,0 16,1 16,2 Wicks, R. (Summer 2011) "Friedrich Nietzsche". The Stanford Encyclopedia of Philosophy, Edward N. Zalta (ed.). Retrieved 6 October 2011. ↑ Brobjer, Thomas. Nietzsche's philosophical context: an intellectual biography, p. 42. University of Illinois Press, 2008. ↑ Robert Matthews (4 May 2003), "'Madness' of Nietzsche was cancer not syphilis", The Daily Telegraph. 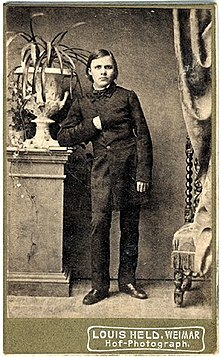 ↑ See his own words: F. Nietzsche (1888), Twilight of the Idols. "Four Great Errors", 1, tr. W. Kaufmann & R.J. Hollingdale (online version). A strict example of a cause-and-effect mismatch, with regard to the God-creator as the cause and our concepts as the effects, is perhaps not fully stressed in this fragment, but the more explicit it is stressed in the same book, chapter "»Reason« in philosophy", 4, as well as in The Antichrist (57, where real and imaginary origins are contrasted, and 62, where he calls Christianity 'a fatality'—'fatal' also meaning 'unavoidable') and in The Genealogy of Morals, books 1–3, among others. The topic of "false origins" of ideas is also suggested in The Four Great Errors, 3, and (precisely about morality) in e.g. The Will to Power, tr. W. Kaufmann, 343 (online text here). ↑ Golomb, Jacob and Robert S. Wistrich (eds. ), 2002, Nietzsche, Godfather of Fascism? : On the Uses and Abuses of a Philosophy. Princeton, N.J.: Princeton University Press. ↑ Marianne Constable, "Genealogy and Jurisprudence: Nietzsche, Nihilism, and the Social Scientification of Law," Law & Social Inquiry 19, no. 3 (1 July 1994): 551–90. ↑ Զվարթ գիտությունը / Ֆ. Նիցշե; Գերմ. թարգմ. և առաջաբ.՝ Հակոբ Մովսեսը; Խմբ.՝ Ա. Պողոսյան. - Երևան: Վան Արյան, 2005. - 516 էջ ; 20 սմ. Առաջաբանը, էջ՝ 5-22 Ծանոթագրություններ, էջ 471-514 ISBN 99941-38-00-6 Մովսես, Հակոբ, 1952- թարգմ. ↑ Բարուց և չարից անդին: Չաստվածների մթնշաղ Փիլիսոփայական երկեր: [Փիլիսոփայական տրակտատ] / Ֆ. Նիցշե; Թարգմ. գերմ.՝ Հակոբ Մովսես; Խմբ.՝ Հր. Ստեփանյան; Ծանոթագր.՝ Կ. Սվասյան. - Չաստվածների մթնշաղ - Երևան: Ապոլոն, 1992. - 272 էջ ; 20 սմ. Ծանոթագր., էջ՝ 259-271 ISBN 5-8079-0434-6 Մովսես, Հակոբ, 1952- թարգմ. Ստեփանյան, Հ. խմբ. Սվասյան, Կարեն խմբ. The time allocated for running scripts has expired. The time allocated for running scripts has expired.